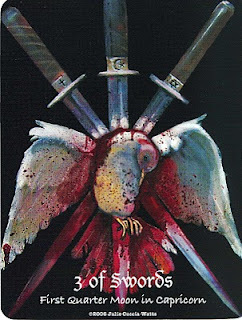 Today's Draw Classic*: Three of Swords from the Maat Tarot by Julie Cuccia-Watts. Has someone broken your heart? What did you do? And are you willing to see it through different eyes? "The message seems to be that religious ideas can sometimes kill peace and cause heartache. Given the number of religious wars there have been, the idea of losing family to violent conflict still underlies this image. There is also the aspect that, when religious ideas separate people, it can destroy families in a more subtle way, too. This is a reminder that we can lose people in many ways. For example, what of the person who comes back from a war or other traumatic situation a changed person? Oftentimes people say they feel that their loved one never really came back, even when they are physically there. So, losing someone to war, to religion, them no longer being there, or being there physically and yet not really present, or unwilling to connect because of differences in belief. Heartache indeed!" Traditionally we think of this card as a broken heart. Someone has hurts us and our heart bleeds, usually in a romantic situation. But as Inner Whispers says above, it doesn't have to be romantic. The person doesn't even have to mean to hurt us. In fact, it doesn't even have to be a person. It can be the spoils of fate that set the pain flowing. Further the heartbreak can be ourselves breaking our own heart. Make each sword symbolize body, mind and soul and you can see how, when the three are not in agreement/alignment, it can kill your own peace...break your own heart. Which dovetails (haha...get it? Dove? Dovetails?) nicely with Julie Cuccia-Watts' interpretation. In the book that comes with this deck, Cuccia-Watts observes the scientific principle that energy is never lost or destroyed, it just changes form. So love is never lost, it just becomes something else. And, if you think logically, the love you had before still remains. And now you have something different to add to it. But what was love before, was still love. Because of this, she posits that heartbreak isn't so much about what you've lost, because you haven't lost anything. Heartbreak is really just the pain that comes from losing control—or from losing the perception that you ever really had control in the first place. Think about it for a second. Isn't that the cause of most of the pain we have in life? Lack of control...and the desire to have it? Lack of control in and of itself doesn't cause pain. It's when you fight against the lack of control that you experience pain. Anytime we try to swim against the stream of "what is", we experience pain. Sadness may be a byproduct of being human, but intense pain, sorrow, heartbreak...all of those can be avoided. Wars happen because we're fighting against the fact not everyone thinks or feels as we do. Heartbreak happens when we fight against the fact that a relationship has changed. Sorrow occurs when we lose something we're not ready to accept the loss of. Ultimately, it's never someone else who is causing the pain in our lives. It's all on us, refusing to accept "what is"...what has changed. It comes from fighting against the flow. Last week we talked about putting on armor to protect ourselves from being hurt. It's ironic that the only impermeable armor there is, is not in holding others at arm's length to keep them from hurting us. It's actually in letting them in and letting whatever will be, be.